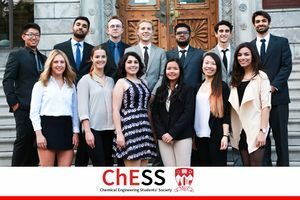 The Chemical Engineering Students' Society(ChESS) is a student organization representing all of the undergraduate Chemical Engineering students at McGill University. ChESS exists to promote student life and learning--through developmental workshops and tutorials, academic forums, industry tours, corporate cocktails and end-of-year banquets. The Constitution by which ChESS currently operates was approved in the 2012-2013 academic year. This official document lays out not only the restrictions and norms that the council follows in day-to-day activities, but also the structure of the organization itself. The Vice-Presidents primarily carry out tasks to fulfill ChESS' purpose, while U-Reps act as a direct liason between students and the society. Events are organized by the VP Internal, VP External and the VP Engagement. Fall Banquets are held at local Montreal restaurants, and the annual Gala takes generally takes place at an independent venue, celebrating the culmination of each year. Apartment and pub crawls are very popular, and are organized both as a Chemical Engineering specific event as well as with ECSESS. At the beginning of each semester, "Welcome Back" events take place, whether that be by offering a Fall BBQ for incoming students or a get-together at someone's house. Events are organized by the VP Internal, VP External and the VP Engagement. Corporate Cocktail in Winter Semester brings together relevant chemical engineering companies to discuss job prospects for the undergraduates. Industry Tours are created to show chemical engineers real life examples of principles and theory learned in coursework. Canadian Chemical Engineering Conference - We organize a delegation of undergraduates to represent McGill Undergraduates and learn about current trends and developments in the chemical engineering industry. We also have access to funds to pay TA’s for Review Sessions - Talk to the VP Academic! This falls under the EUSF fund which depends on the number of students enrolled in the program. VP Academic also controls a fund called the EFC that allows the Professors fund equipments for their labs once a year. VP Academic holds at least one academic forum per semester where students get to give feedback on courses. This feedback is forwarded to the Department chair and actions are taken if necessary. So student feedback is greatly valued in the department. In the Summer of 2016, ChESS initiated a program that aims to create tutorial content online for courses that students struggle with under the portfolio of VP Academic. Each spring the Corporate Cocktail takes place, yielding a point of contact between students and prospective employers as well as an opportunity for students to gain valuable information and hone their networking skills. Industry tours are organized to local Montreal companies, and a group of students is sent to the CSChe Conference each year. In hopes for transparency, here is where your money goes. These are past budgets, not for current year as it is constantly updated. The Design Room is located at WONG 1040 and is available to students registered in CHEE 453 or CHEE 456/457. Chemical Engineering-related software is installed on these computers as it is an EMF lab.